This is something that should confound us. Do we pay attention to the fact that the highest Angels of Heaven do not have the type of union with Our Lord that we have when we receive the Holy Eucharist? 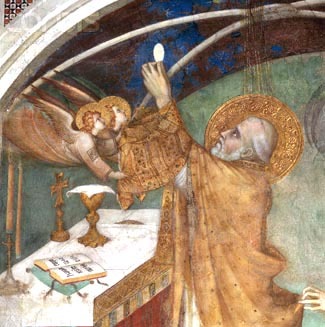 An Angel cannot receive the Eucharist. He has no body. He has the beatific vision; he sees God face to face; he is inundated with all the graces of Heaven, but he does not have the Blessed Sacrament. Have we ever thought about these things? Have we ever considered that the Angels of Heaven look at us with envy, so to speak, because we have this grace? Should we not, then, receive that grace with more respect and more preparation? When someone receives Holy Communion, he sees only a small round piece of flour and water. But our Catholic Faith teaches us that all the Angels and Saints of Heaven, who continuously adore every particle of the Blessed Sacrament that exists on Earth, witness our Communions with songs and praise to Our Lord. Our Lady also praises Our Lord because He is giving Himself to each one who receives Him. All of Heaven is looking on and asking Our Lord to help the person receiving the Holy Eucharist. It should be most encouraging for us when we receive Communion to realize that all of Heaven is watching us and praying for us. If I could use the word, I would say that all of Heaven is “cheering” for us, asking Our Lady to have pity on us, to help us. What joy and beauty there is in the scene of a single Communion! If we would meditate on this before receiving Communion, would we not communicate with more hope, confidence and joy? Of course we would. Therefore, it behooves us to keep these things in mind as we prepare our souls to receive Communion. This exercise of St. Ignatius is so deep, so rich, that each part of the text could be extended into a much larger commentary. But since St. Ignatius presents it schematically, I am following his method and confining myself to what I believe is indispensable for your formation. This is a very profound thought. He says these words, “You should be confounded by your ingratitude.” That is to say, we should think of our past Communions and become confounded in face of our ingratitude. “My Lord, I cannot find the words to speak to You. I see that I have gone astray, but I confide in You because You are the solution for everything. You are the Way, the Truth and the Life. Like St. Mary Magdalene, I prostrate myself here at Your feet with my sins. Confiding in You, I know that You will not turn me away or abhor me. This is what to be confounded means, a confiding confusion, a perplexity abounding with the hope of being assisted. This is the kind of confusion we should have before the Blessed Sacrament. This is how we should receive Communion. St. Ignatius also recommends we should ask God to change our spirit. Our Lord can change the spirit of a man from one moment to the next. History records many cases of sudden conversions. He can also change the spirit of a man slowly, step by step through a period of many years. If we ask Our Lord every day when we receive Communion to convert us, to change us, one day He will do it. It is said that St. Francis de Sales - I did not have time to confirm the story – gave Communion every day to a man who went to daily confession with the Saint. That man was very weak and fell again and again into the same sins. 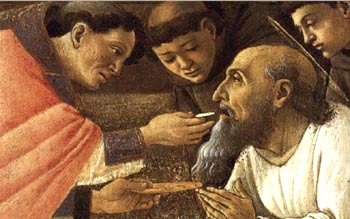 St. Francis absolved him and gave him Communion every day of those 30 years. At the end of that time, the man amended and lived a model life. How did this happen? It was through the Holy Eucharist that he received with holy confusion, with confident perplexity. Every day, that man was improving a little, rising a little. Why? Because the Holy Eucharist is the soul of our spiritual life; it it is the center and the focus of our spiritual life. This is how we should consider the Communion that we receive.